This article was written By John Berra on 03 Feb 2011, and is filed under Reviews. My current research project as Lecturer in Film Studies at Nanjing University is a study of the cinema of Lou Ye, the Sixth Generation Chinese filmmaker whose credits consist of Weekend Lover (1995), Suzhou River (2000), Purple Butterfly (2003), Summer Palace (2006) and Spring Fever (2009). In order to put Lou’s work into context, I have been viewing films by other Sixth Generation directors. The following review will be the last of three pieces (editor’s note: the first two are here and here, respectively) for VCinema that consider Chinese films of social-political significance from the past fifteen years. The choice of a film by Jia Zhangke to complete this review series is as inevitable as it is necessary. Jia is often referred to as the ‘figurehead’ of the Sixth Generation, which sometimes seems to ignore the invaluable contributions made by such filmmakers as Li Yang, Lou Ye, Wang Xiaoshuai and Zhang Yuan. However, this widely-accepted status also serves to acknowledge the prominence of Jia’s work on the international festival circuit, not to mention the manner in which his name has become synonymous with contemporary Chinese cinema in the hearts and minds of academics and art-house audiences. Jia is a particularly prolific filmmaker, which is quite an achievement when the careers of other independently-minded Chinese directors have been dramatically curtailed by the social-political sensitivity of the Chinese Film Bureau; Lou has endured bans of two and five years for, respectively, Suzhou River (2000) and Summer Palace (2006), while Li Yang had to wait four years to follow Blind Shaft (2003) with Blind Mountain (2007) due to the debate caused by the earlier film’s unflinching depiction of the Chinese mining industry. By contrast, Jia has worked constantly, completing documentaries, features and shorts which, although sometimes refused official release by the Film Bureau, have never resulted in a ban on the filmmaker himself. Having achieved some degree of financial independence by establishing his own production company (Xstream Pictures) and being allocated various critical accolades and festival prizes (Still Life was awarded the Golden Lion at the 2006 Venice Film Festival), Jia has become internationally recognised to the point that the Film Bureau has to work with him rather than against him. This has led to accusations that Jia has to some extent ‘sold out’, with such criticism intensifying after screenings of his state-commissioned Shanghai documentary I Wish I Knew (2010). However, the social concerns of his work have remained the same, while such recent films as Still Life and 24 City (2008) have achieved a stunning distillation of the fact/fiction hybridity that Jia has been pursuing and refining since his first feature Xiao Wu (1997). All of Jia’s films concern the changing landscape of China at a time of economic acceleration and the value systems of individuals who either take advantage of this resurgence, or choose to stay on the traditional path. The characters in Jia’s films are frequently framed against – or trapped within – rapidly evolving environments, such as the urban wasteland of Unknown Pleasures (2002), the globalised theme park of The World (2004) or the forgotten munitions factory of 24 City. In terms of capturing China in transition, Still Life is Jia’s most visually stunning film to date, although this is not to say that it is self-consciously exotic; the location of Yangtze River region may offer many of the temptations associated with such cinematic tourism, but Jia’s detailed approach to composition provides as much consideration to the consequences of modernity as it does to the natural splendour of the area. 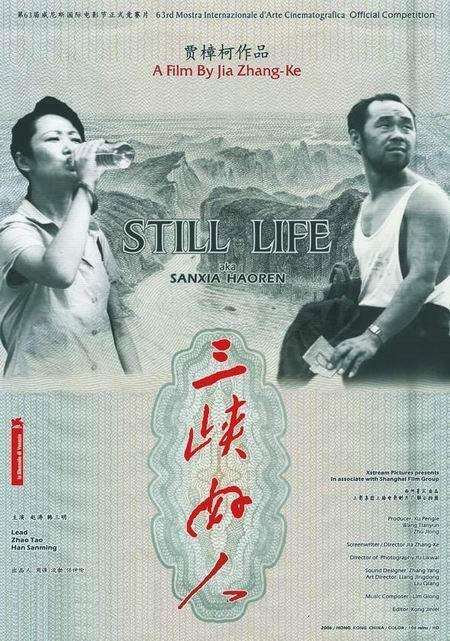 Still Life was shot on high-definition digital video by the Hong Kong cinematographer Yu Lik-wai, who has worked on all of Jia’s films since Xiao Wu (1997) while also embarking on his own directorial career with All Tomorrows Parties (2003) and Plastic City (2008). Yu’s mastery of his craft is evident in every frame of Still Life, which lives up to its name in terms of providing a cinematic portrait of region that is being erased from the map. Sixth Generation Chinese Cinema was largely made possible by the digital revolution, with filmmakers able to work quickly and cheaply thanks to the development of cameras that are as increasingly lightweight as they are sophisticated; Still Life fully realises the cinematic potential of this technology by balancing the spectacles of immovable landscape and urban destruction with the humanistic nuances of daily life, often within the same scene or shot. The events of Still Life occur in and around the Southern town of Fengjie, which is located on the Yangtze River and is being gradually demolished to make way for the construction of the Three Gorges Dam. Most residents of Fengjie are leaving town, voluntarily or otherwise, which makes Han Sanming (Han Sanming) something of an exception; a coalminer from the Eastern province of Shanxi, he arrives in Fengjie by boat hoping to find Missy Ma (Ma Lizhen), the wife who ran away sixteen years ago while pregnant with his child. Sanming attempts to discover her whereabouts by navigating the networks of bureaucracy (the local municipal office) and extended family (his wife’s brother), eventually learning that his estranged partner and daughter are working downriver in Yichang, but will soon return to Fengjie. The coalminer checks into a basic hotel called the Chinese Palace and, after befriending local teenager and small-time enforcer Brother Mark (Zhou Lin), makes a temporary career change to demolition work as a means of funding his stay. A second story is then introduced as the comparatively middle-class Shen Hong (Zhao Tao) comes to Fengjie to make contact with her husband Guo Bing; he left home two years earlier to pursue business opportunities related to the redevelopment of Southern China and has made little effort to stay in touch with his spouse. After finding her husband through one of his friends, the archaeologist Wang Dongming (Wang Hongwei), she reveals the reason for her visit. Once the personal business of Shen Hong is concluded, the film returns to Sanming, who has become quite settled in Fengjie and made new friends through demolition work, although he has resisted Brother Mark’s offer of earning extra money by intimidating locals into leaving their homes. Sanming gets one step closer to reconnecting with his daughter when Missy Ma returns to town, but is saddened when Brother Mark’s pursuit of additional income has tragic consequences. In an unhurried manner, Jia offers examples of the black market economy that has sprung up in Fengjie as a by-product of the Three Gorges Dam project; an opportunistic motorcyclist takes money from Sanming to drive him to a residential address even though he knows that area has already been flooded, local thugs are paid by demolition officials to beat up any residents who are refusing to move out buildings that are due to be destroyed, and prostitutes offer their services to the workers who reside at the Chinese Palace. This inclusion of the re-emergence of prostitution in Jia’s social-political critique was the one element of Still Life that China’s Film Bureau took issue with, leading to some cuts in exchange for mainland commercial release, although these scenes have remained in the international version. Such illegal activities – and also the legal demolition work that Sanming undertakes – have been made possible by the increasingly relaxed attitude of the Chinese government towards migration, with an estimated thirty-five per-cent of the population now considered to be ‘floating workers’. Jia presents a Fengjie where everyone is passing through, with the Chinese Palace proving to be a place of much misunderstanding as different dialects cause conversational difficulties. A late exchange between Sanming and a prostitute who had previously provided him with some information about his daughter summarises this adjustment to professional mobility: ‘You’re leaving in such a hurry’, he observes. ‘Such is life’, is her reply. Migration makes it possible for a decent man like Sanming to support himself while belatedly searching for his runaway wife, but it also enables less principled individuals such as Guo Bing – who is revealed to be giving orders to Brother Mark’s strong-arming outfit – to profit from the burgeoning real estate business. Ideological differences are becoming more common in China, even within the same social class, and these points of view are verbalised in the conversations between Sanming and Brother Mark, who become friends despite their opposing outlooks. Sanming is hard-working and able to form social relationships when far from home, while his ideology is reflected by the ringtone on his mobile phone which plays ‘Bless Good-Hearted People’. The coalminer from Shanxi is comfortable with his cultural identity, but Brother Mark prefers to take his name, look (swaggering around town in sunglasses) and life philosophy (‘Present day society doesn’t suit us because we’re too nostalgic’) from Chow Yun Fat’s character of Mark Gor-Lee in John Woo’s crime drama A Better Tomorrow (1986). He even imitates his role model by lighting his cigarette from a burning piece of paper after watching a pirate DVD copy of Woo’s film. Brother Mark gently mocks his new friend for being out of touch with the times and it is true that Sanming is ideologically adrift as he looks for a past where there is no longer a present, just a sudden, state-ordered shift into the future. However, his fundamental principles remain as immovable as the surrounding landscape, making Sanming a solidly reassuring, largely unshakable presence within Jia’s framework. At key junctures in Still Life, four chapter titles appear (‘Cigarettes’, ‘Liquor,’ ‘Tea’, and ‘Candy’), each of which refers to something that is offered in order to achieve social integration. These titles have a structural purpose, but also enable Jia to state that the time-honoured values that Sanming holds on to are still relevant in a world where everything that once had value now seems to be marked for demolition. In terms of its repetitious, dual-narrative structure, Still Life has some similarities with Apichatpong Weerasethakul’s spellbinding Syndromes and a Century (2006), but Jia’s concerns are social rather than spiritual. The experience that Sanming has in Fengjie is carefully contrasted with that of Shen Hong, whose story parallels his in that she also arrives by boat to search for a missing partner, whom she eventually encounters. Shen Hong, however, pays less attention to the surrounding area and only wants to complete her personal business as soon as possible so you can be on the next boat out. As someone who has spent most of his life working underground, Sanming is fascinated by what is happening to his country at surface level, pausing in his quest for familial reconnection to look at demolition sights and the Yangtze River, while Shen Hong is unable to relax, even when in the friendly company of Wang Dongming. Their approaches to their estranged spouses are also decidedly different; Shen Hong makes accusations and declares that she wants a divorce, while Sanming shows little animosity towards the woman who left him, only wanting to see his daughter. ‘You look more tanned these days’, he tells her, exhibiting an easy-going, level-headed manner that is far removed from Shen Hong’s icily hostile ‘wronged woman’ routine. The responses of Sanming (curious) and Shen Hong (oblivious) to the town of Fengjie in its final days reflect their social-economic positioning (working man and emergent middle-class). The two social opposites never meet, although they are tenuously connected by the character of Guo Bing, and Jia links their experiences through music that is both diegetic (Sanming’s mobile phone ringtone, a young boy who likes to sing in the street) and non-diegetic (emotive pop songs, Lim Giong’s haunting score). Setting the stories of Sanming and Shen Hong against the backdrop of the Three Gorges Dam project lends Still Life a quasi-documentary quality as these fictional characters float through an environment that actually is in the process of being flooded. 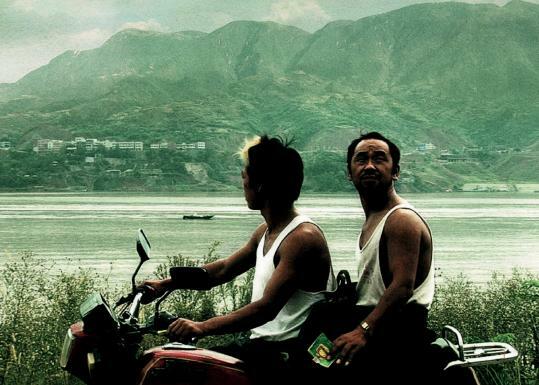 Jia extended this hybridity to the companion piece Dong (2006) – a documentary about the artist Liu Xiaodong who was painting labourers in the region – which featured an in-character appearance by Han Sanming and reuses footage from Still Life. He then made 24 City, in which interviews with real factory workers were combined with scenes performed by established actors, then If I Knew which intercut shots of Zhao Tao wandering around Shanghai with interview subjects and archive footage. Still Life is not as meta-textual as Jia’s subsequent projects, but it does make playful reference to his earlier work; Han Sanming also played a character called Sanming in Platform (2000) and The World, the enthusiasm that Brother Mark has for A Better Tomorrow recalls the references to Quentin Tarantino’s Pulp Fiction (1994) in Unknown Pleasures and a scam artist talking about ‘intellectual property rights’ serves as a reminder that Jia’s previous films are only available in his home country in pirated form. There are also some surreal touches that introduce elements of science-fiction (men in chemical suits at demolition sites, a UFO shooting through the sky) and magical-realism (a tightrope walker making a crossing between two soon-to-be-demolished buildings while he still can) which emphasise the increasingly alien nature of the contemporary landscape and make connections between past, present and future. A beautifully realised cinematic record of the price of progress, Still Life arguably ranks as one of the finest films of the past decade. An equally interesting and humanistic study of the Three Gorges Dam project is provided by Up the Yangtze (2008), a compelling documentary by the Chinese-Canadian director Yung Chang. 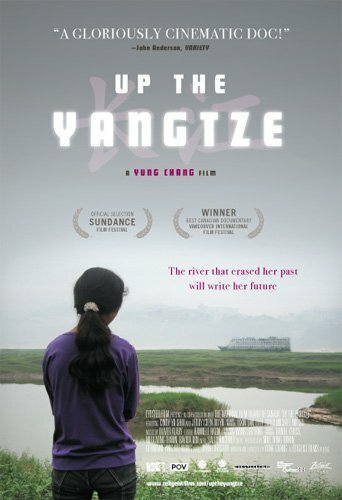 Up the Yangtze follows the fortunes of two young people from different backgrounds who must accept that their lives are changing along with the surrounding landscape. Yui Shui leaves her peasant family to work on a cruise ship, where she serves Western tourists, while Chen Bo Yu is from a comparatively middle-class home and works on the ship as a porter. In-keeping with China’s desire to cater to foreign tourists, they are given the Western names of Cindy and Jerry, but while the enterprising, English-speaking Chen is keen to get ahead, the less sociable Yui finds herself feeling homesick. However, the riverbank home she is missing may not be there when she returns as her family is being forced out due to the flooding that is taking place in order to build the biggest hydroelectric dam in history. Up the Yangtze was shot after Still Life and, as such, makes a fascinating companion piece as the chaos depicted in Jia Zhangke’s film is shown at a more advanced stage; elderly residents are being forced to move from rural areas to big cities, while commercial opportunity is taking priority as tourism becomes a boom industry due to interest from Westerners wanting to see the ‘old China’ before it disappears. It is estimated that, by the time the dam is completed, as many as two million people will have been relocated and Up the Yangtze shares many of the qualities of Still Life in that it places the struggles of the individual within the context of the bigger picture. Editor’s note: John wishes to dedicate this piece to the staff and students of CUEAFS who lost a very special member, Nadia Baird, on the day this review was posted. Please visit the society Facebook page where you can express your sympathies.